A true pioneer in the modern premium segment – now with Rimowa Electronic Tag. Presenting Salsa, Rimowa’s innovative generation of lightweight luggage conceived, designed and manufactured in accordance with the state of the art. Made of 100% Polycarbonate for the toughest of conditions, this ultra-light luggage is particularly sturdy and extraordinarily flexible. If compressed, Salsa will return to its original shape automatically when the pressure is released. 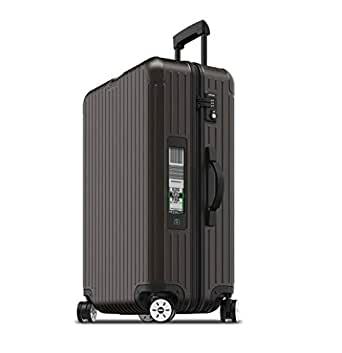 br br Introducing the first fully-integrated digital suitcase: RIMOWA Electronic Tag. A technology that will redefine travel. Using this new technology, travellers will be able to check-in their luggage from home using their smartphone and drop it off at the airport in seconds – without all the stress and time pressure. This is made possible through RIMOWA’s use of technology that is directly integrated into select RIMOWA suitcases. The RIMOWA Electronic Tag replaces the usual paper label with a digital data module to which the airlines luggage data is transmitted.